Brand Me! - The 1% Edge: The Power of Thinking Small - What? The Power of Thinking Small - What? Ok...I know what you're already thinking...."think small?" "I've not heard that before; aren't you suppose to think big?" I know. What you have heard is think big. I am requesting for the moment, please set aside that adage and consider, just for the moment, the concept of thinking small. I really believe it's possible that in certain contexts, thinking big can actually be an impediment to getting results. Thinking big can generate a feeling of being overwhelmed, can lead to a state of procrastination and both these scenarios can hamper progress. Consider then, the concept of thinking small...thinking in chunks, bites, or baby steps. Remember the movie, What About Bob? In fact when trying to accomplish a goal or task, the best way to approach the needed action is with one small thing that can actually get done in the quickest and most efficient amount of time. I was thinking this morning about building a long sidewalk. There are several ways to approach it. You can put down huge, heavy concrete slabs which would take several men and a crane to lay. Or you can take small bricks that are easy to move around and can be layed quickly with minimal man power. A huge concrete slab or a brick --which one sounds more manageable to you? I'm thinking...the brick. The same holds true in productivity. In an attempt to get alot done and to reach "big goals" we try to start out doing alot and doing big things, which in some cases can take a lot of energy. And, it may additionally cause us to become discouraged early because we may not generate tangible results soon enough. Consider the brick approach. Break needed action items into small amounts that can actually be accomplished quickly. The result?...you get results! Additionally, you feel satisfaction and that motivates you to continue to move forward and with that you are kick starting the needed momentum for the potential tougher challenges ahead. So is thinking big legitimate? 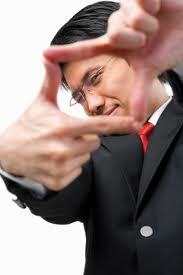 Of course, thinking big is about having vision, seeing the big picture, creating the larger outcome. So combine the two; think big then think small. Perhaps the new mantra should be, "Think big, start small"...one brick at a time. Your 1% Tip: Think bricks!